For many casual music fans, the solo career of George Harrison is anchored by two distinct memories. The release of his post-Beatles solo album All Things Must Pass in 1970, and his dynamic radio hit 17 years later with the infectious "I've Got My Mind Set on You". Fortunately, Capitol Records has chosen to collect six out-of-print solo records released between 1976 and 1992 to round out the artistic image of George Harrison for both the casual and dedicated follower. 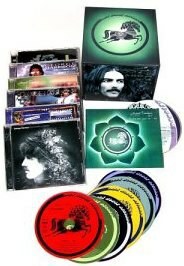 The set features pristinely remastered versions of 33 & 1/3, George Harrison, Somewhere in England, Gone Troppo, Cloud 9, and Live in Japan as well as a bonus DVD collecting videos, performances, and interviews from each corresponding album. All of the studio albums feature bonus tracks and extended liner notes, while Live in Japan is presented in the Super Audio format and 5.1 surround sound. The result of this arduous task is a painstakingly crafted collection that provides a fitting and deserved tribute to an artist that is often under appreciated for the scope of his efforts as a solo artist. Chronologically, 33 & 1/3 is the first album in this collection. Coming on the heels of Harrison's successful early '70s albums like Living in the Material World and Extra Texture, 33 & 1/3 provides a slight update on his winning style. Elements of honky-tonk barrelhouse blues fuel the foot stomping "Woman Don't You Cry For Me", while the magnificent "Dear One" wouldn't have been out of place on the Beatles Sgt. Pepper's. The remastered version allows the guitars to ring, and the percussion has a crispness that was hidden in past releases. This album features countless classic tracks, the four on the floor matter of factness of "Beautiful Girl", the dynamic harmonics of "See Yourself", and the soaring country flavored "True Love", which finds Harrison delivering a spirited vocal performance. 33 & 1/3 features more consistent high points than any Harrison album since All Things Must Pass. The focus of the eponymously titled, George Harrison finds a significant shift towards a jazz-tinged adult radio style of composition. Much of the album floats by on Harrison's acid drenched guitar, setting a languid and addictive pace. There are a few tracks that step ahead of the rest, including the dreamy psychedelic sing-a-long "Here Comes the Moon", the jaunty upbeat "Blow Away" which forces a smile upon each listen, and the brief but joyous country spiritual "If You Believe". George Harrison is the first evidence of the wit that was to emerge in full force on Somewhere in England and is built upon the new found sense of calm and peace that speaks through his ever-emotive guitar. Somewhere in England finds Harrison eschewing his past somber tones that coursed through albums like Dark Horse and Extra Texture. There is a lighthearted playfulness exposed on "Unconscious Mind" and "Blood of a Clone". Both show a razor sharp wit in Harrison's lyrics that proves to be a cunning companion to his beatific guitar leads. There are also a host of undiscovered gems on Somewhere in England led by the yearning ballad "Life Itself" and the whimsical upbeat number "Teardrops". Again, the remastering allows these tracks to shine and the result is that Somewhere in England deserves to be recognized as one of the greats in Harrison's catalogue. Every artist has an album that stands out as a poor misstep in his or her career. For George Harrison, it is the synthesizer-heavy, '80s-influenced Gone Troppo. Mix equal parts Jimmy Buffet, generic '80s synth-pop, and a shadow of the Harrison seen on previous releases and you have the mismatched set known as Gone Troppo. It's inclusion in The Dark Horse Years is a necessity from a historical perspective, but from an artistic perspective this is a poor representation of the genius of this former Beatle. Released in 1987, Cloud 9 is best remembered for the hit single "I've Got My Mind Set on You", and for being the last album of new Harrison material until the posthumously released Brainwashed in 2003. The five years since Gone Troppo found Harrison moving away from the sound of his legendary weeping guitar and focusing his compositions more on his vocal ability. Due to this shift, a spirit transcends this album that reminds listeners of the works of Harrison's longtime friend Bob Dylan. This shift towards the confessional is most effective on the jumping "Fish in the Sand", the Beatles retrospective and "Dear Prudence" copycat "When We Was Fab", and, of course, the pop radio smash "I've Got My Mind Set on You". While this release may not characterize many of the standard Harrison production and songwriting traits, it provides an alternate and fresh take of one of rock's most solitary and important artists. The most recent offering in the Dark Years set is the double disc Super Audio CD Live in Japan from 1992. Here Harrison is joined by his collaborator of 25 years, Eric Clapton, and a crack band to perform a wealth of Harrison originals from both his solo and Beatles career. The collection is uneven, but there is still a handful of shining moments. Revolver's "Taxman" stands up live to equal the studio recording, and the jangle pop masterpiece and blueprint for the Britpop movement "What is Life" from All Things Must Pass is just as vibrant as it was upon initial release 22 years earlier. Disc 2 packs in the heavyweights with faithful and necessary versions of Abbey Road's "Here Comes the Sun", the religious and legally controversial "My Sweet Lord", the serendipitous "Isn't It a Pity" that Harrison co-wrote with Bob Dylan, and a majestic interpretation of "While My Guitar Gently Weeps" featuring exquisite guitar work by both Harrison and Clapton. Live in Japan as an album is flawed, dated and uneven at points, but nonetheless bloody essential for these tracks alone. After standing in the shadow of John Lennon and Paul McCartney for so many years, George Harrison has had a resurgence of attention and praise in recent years. In the popular press he has been credited by the likes of Oasis' Noel Gallagher as the most talented Beatle, and Harrison's musical legacy has contributed greatly to the exuberance of Britpop in the '90s. The collection Dark Years gathers the lesser known albums from the late part of Harrison's career, merges them with bonus recordings, liner notes, and DVD footage to enhance and solidify his legacy. With this type of dedication, Dark Years has delivered Harrison an immeasurable service by adding even greater dimension to the portrait of a legend.